All bathroom suites need a toilet, however when space is tight it can be hard to find the right design that meets all the right requirements. 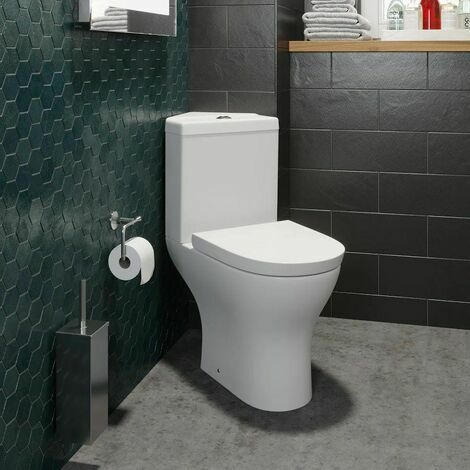 The Ceramica Arles Corner Toilet and Soft Close Seat ticks all of the boxes when it comes it to style, functionality and practicality, making it perfect for any bathroom, especially for those who love modern designs but are unfortunately stuck with a space restrictive bathroom. The reason this particular toilet is great for smaller bathroom is it's ability to be installed in a corner due to its uniquely shaped cistern. This allows for more leg room and more floor space in general, allowing more space to easily organise your bathroom. Not only will you be saving space with this toilet, but you'll be saving water too! The handy dual flush push button allows you to choose the volume of your flush, either a full or half flush, meaning you won't be wasting any unnecessary water. We have also included a luxurious and comfortable soft close toilet seat. This provides a quieter operation when the lids closing and saves the pan from damage if the seat is accidentally dropped. For that added peace of mind, we have included a brilliant 10 year guarantee on the toilet and 2 year guarantee on the toilet seat.